Conspiracies: Conspiracy Theories ? 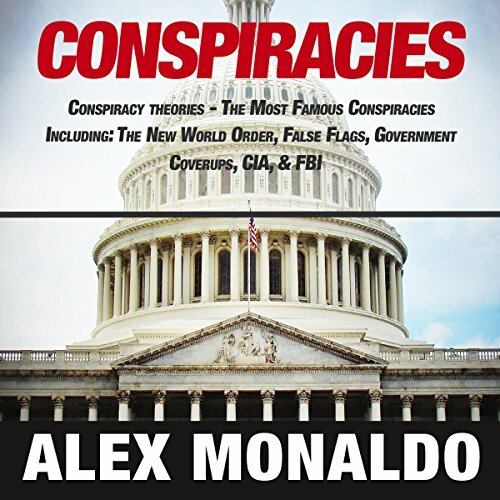 The Most Famous Conspiracies Including: The New World Order, False Flags, Government Cover-ups, CIA, FBI by Alex Monaldo at Spring Brook Audio. Hurry! Limited time offer. Offer valid only while supplies last. Want the real story behind history's great Conspiracies? Uncover the truth today! Get hold of more theories from this book! Now on its 3rd Edition! Was The Holocaust a Conspiracy? Break the status quo - question your beliefs on history in a new way. Raise your critical thinking and awareness of current events. Learn what can't be found on mainstream news and TV outlets. So what are you waiting for?! Get ready for a revelation of a lifetime! This book will definitely answer any questions you have regarding some of history's most unforgettable events. Go deeper now and get your own copy TODAY! by scrolling up. Don't forget to hit the BUY button! Enjoy! View More In Hoaxes & Deceptions. If you have any questions about this product by Alex Monaldo, contact us by completing and submitting the form below. If you are looking for a specif part number, please include it with your message.